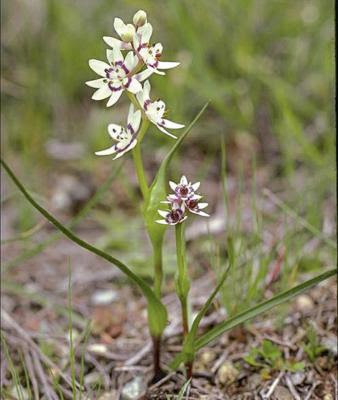 Male (left) and female plants of Wurmbea dioica, copyright Murray Fagg. The Colchicaceae are a family of perennial herbs growing from corms or rhizomes. Characters (from here): Colchicine alkaloid present, flavones present, steroidal saponins absent; raphides absent; cuticular wax with parallel platelets; leaves conduplicate, blade with midrib (occasionally absent), base sheathing; inflorescence various, flowers axillary; tepals towards base U-shaped and folded around each stamen in bud, connate or not, sexine thick; styluli present, or style ± branched, or stigma with recurved lobes, wet or dry; ovules 2-many/carpel, ± ascending, orientation various, micropyle bistomal; antipodal cells multinucleate; capsule septicidal; seeds rounded, strophiole, sarcotesta or aril present; phlobaphene present; embryo small; chromosomes 1-16 µm long; cotyledon photosynthetic or not, bifacial (occasionally ligulate). [CV06] Craven, P., & P. Vorster. 2006. Patterns of plant diversity and endemism in Namibia. Bothalia 36 (2): 175–189. [KM08] Keighery, G. J., & W. Muir. 2008. Vegetation and vascular flora of Faure Island, Shark Bay, Western Australia. Records of the Western Australian Museum Supplement 75: 11–19. [NDG98] Neal, P. R., A. Dafni & M. Giurfa. 1998. Floral symmetry and its role in plant-pollinator systems: terminology, distribution, and hypotheses. Annual Review of Ecology and Systematics 29: 345–373. [P01] Persson, K. 2001. A new soboliferous species of Colchicum in Turkey. Botanical Journal of the Linnean Society 135 (1): 85–88.